We have had pet chickens for a few years now, starting off with a 2 rhode island reds and 2 speckled hybrids. In 2007 we got an awesome little hen, she is a bantam partridge Silkie (Toyah) and i fell in love with the breed. I hatched a few chicks for my sister using the hand turning method and found a love for it, i now hatch chicks from my own birds as a hobby and sell them to pay for their upkeep. 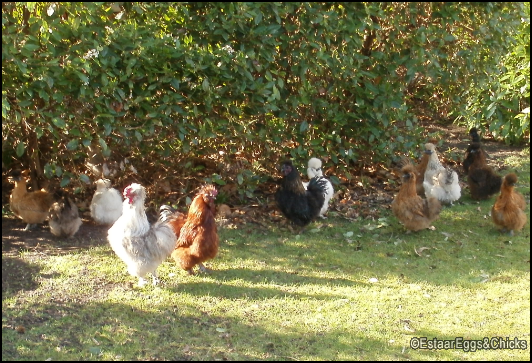 The bird to the left is one of my Polish hens (Omelet). I sell anything from Hatching eggs to day olds to POL(Point of Lay) depending on what i have in stock. We are based in the UK midlands.